The XML Events module defined in this specification provides XML languages with the ability to uniformly integrate event listeners and associated event handlers with Document Object Model (DOM) Level 2 event interfaces [DOM2EVENTS]. The result is to provide an interoperable way of associating behaviors with document-level markup. This document is a Recommendation of the W3C. It has been reviewed by W3C Members and other interested parties, and has been endorsed by the Director as a W3C Recommendation. It is a stable document and may be used as reference material or cited as a normative reference from another document. W3C's role in making the Recommendation is to draw attention to the specification and to promote its widespread deployment. This enhances the functionality and interoperability of the Web. A test suite for XML Events has been developed as part of a public XForms 1.0 Test Suite, along with an implementation report. This document has been produced by the W3C HTML Working Group (Members only) as part of the HTML Activity. The goals of the HTML Working Group are discussed in the HTML Working Group charter. Patent disclosures relevant to this specification can be found on the Working Group's patent disclosure page. An event is the representation of some asynchronous occurrence (such as a mouse click on the presentation of the element, or an arithmetical error in the value of an attribute of the element, or any of unthinkably many other possibilities) that gets associated with an element (targeted at it) in an XML document. Event flow in DOM2: an event targeted at an element (marked 'target') in the tree passes down the tree from the root to the target in the phase called 'capture'. 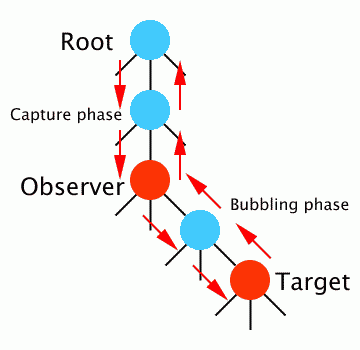 If the event type allows it, the event then travels back up the tree by the same route in a phase called 'bubbling'. Any node in the route, including the root node and the target, may be an 'observer': that is to say, a handler may be attached to it that is activated when the event passes through in either phase. A handler can only listen for one phase. To listen for both you have to attach two handlers. An action is some way of responding to an event; a handler is some specification for such an action, for instance using scripting or some other method. A listener is a binding of such a handler to an event targeting some element in a document. HTML [HTML4] binds events to an element by encoding the event name in an attribute name, such that the value of the attribute is the action for that event at that element. This method has two main disadvantages: firstly it hardwires the events into the language, so that to add a new event, you have to make a change to the language, and secondly it forces you to mix the content of the document with the specifications of the scripting and event handling, rather than allowing you to separate them out. SVG [SVG] uses a similar method. Syntactically expose the DOM event model to an XML document [XML]. Provide for new event types without requiring modification to the DOM or the DTD. Allow for integration with other XML languages. A definition of event flow, as sketched above. Element listener and its attributes defined in this specification are the method of binding a DOM level 2 event at an element to an event handler. They encapsulate various aspects of the DOM level 2 event interface, thereby providing markup-level specification of the actions to be taken during the various phases of event propagation. This document neither specifies particular events, nor mandates any particular methods of specifying actions. These definitions are left to any markup language using the facilities described here. The document must conform to the constraints expressed in Appendix B - Schema Implementation or Appendix A - DTD Implementation, combined with the constraints expressed in its host language implementation. When XML Events are included in a host language, all of the facilities required in this specification must be included in the host language. In addition, the elements and attributes defined in this specification must be included in the content model of the host language. This specification defines a module called XML Events. The XML Events module uses the XML namespace [XMLNAMES] identifier http://www.w3.org/2001/xml-events. Examples in this document that use the namespace prefix "ev" all assume an xmlns declaration xmlns:ev="http://www.w3.org/2001/xml-events" somewhere suitable in the document involved. All examples are informative. The remainder of this section describes the elements and attributes in this module, the semantics, and provides an abstract module definition as required in [XHTMLMOD]. The required event attribute specifies the event type for which the listener is being registered. As specified by [DOM2EVENTS], the value of the attribute should be an XML Name [XML]. The optional observer attribute specifies the id of the element with which the event listener is to be registered. If this attribute is not present, the observer is the element that the event attribute is on (see later under "Attaching Attributes Directly to the Observer Element"), or the parent of that element (see later under "Attaching Attributes Directly to the Handler Element"). The optional target attribute specifies the id of the target element of the event (i.e., the node that caused the event). If this attribute is present, only events that match both the event and target attributes will be processed by the associated event handler. Clearly because of the way events propagate, the target element should be a descendent node of the observer element, or the observer element itself. and the user happens to click on the word "draft", the <em> element, and not the <a>, will be the target, and so the handler will not be activated; to catch all mouse clicks on the <a> element and its children, use observer="link1", and no target attribute. The optional handler attribute specifies the URI reference of a resource that defines the action that should be performed if the event reaches the observer. (This specification does not mandate what form that element should take: see further the section "Event Handlers"). If this attribute is not present, the handler is the element that the event attribute is on (see later under "Attaching Attributes Directly to the Handler Element"). The optional phase attribute specifies when (during which DOM 2 event propagation phase) the listener will be activated by the desired event. Listener is activated during capturing phase. Listener is activated during bubbling or target phase. The default behavior is phase="default". Note that not all events bubble, in which case with phase="default" you can only handle the event by making the event's target the observer. The optional propagate attribute specifies whether after processing all listeners at the current node, the event is allowed to continue on its path (either in the capture or the bubble phase). event propagation continues (unless stopped by other means, such as scripting, or by another listener). The default behavior is propagate="continue". The optional defaultAction attribute specifies whether after processing of all listeners for the event, the default action for the event (if any) should be performed or not. For instance, in XHTML the default action for a mouse click on an <a> element or one of its descendents is to traverse the link. the default action is performed (unless cancelled by other means, such as scripting, or by another listener). The default value is defaultAction="perform". Note that not all events are cancelable, in which case this attribute is ignored. The optional id attribute is a document-unique identifier. The value of this identifier is often used to manipulate the element through a DOM interface. Note that observer = "<element-id>" and event = "<event-type>" are similar to the begin = "<element-id>.<event-type>" attribute in SMIL EventTiming [SMIL20]. This example attaches the handler in the element at "#doit" that will get activated when the event called activate occurs on the element with id="button1", or any of its children. The activation will occur during bubbling, or if the event happened on the observer element itself, when the event reaches the element (phase target). This attaches the handler at #overflow-handler that will get activated when the event overflow occurs on the element with id="expr1" and bubbles up to the element with id="prog1". This attaches the handler at #popup that will get activated whenever an activate event occurs at the element with id="embargo" or any of its children. Since it will be activated during the capture phase, and propagation is stopped, this will have the effect (regardless of what the handler does) of preventing any child elements of the embargo element seeing any activate events. This attaches a handler from another document. All the attributes from the listener element with the exception of id may be used as global attributes, as defined in Namespaces in XML [XMLNAMES], to attach the attributes to other elements. Nonetheless, for utility the <listener> element has been retained. If the observer attribute is omitted (but not the handler attribute), then the element that the other attributes are attached to is the observer element. This first example will attach the handler identified by "#popper" to the <a> element, and cancel the default action for the event. This will attach the handler at #handle-overflow for the event overflow to the current element. If, when attaching the global attributes to an element, the handler attribute is omitted then the element that the other attributes are attached to is the handler element. Note that, since the observer and target attributes are IDREFs, in this case the handler and observer/target elements must be in the same document (while in other cases, since the handler attribute is a URI, the handler element may be in another document). If the observer attribute is also omitted, then the parent of the handler element is the observer element. In this case the element is the handler for the submit event on the element with id="form1". In this case the <action> element is the handler for event q-submit, and the observer is the questionnaire element. The <script> element is the handler for event click; the <img> element is the observer. The <onevent> element is the handler for event enterforward. The <card> element is the observer. The <catch> element is the handler for the nomatch event. The observer is the <field> element. This example shows three handlers for different events. The observer for all three is the <secret> element. The following table summarizes which elements play the role of observer or handler if the relevant attribute is omitted. This specification does not require an XML application that uses XML Events to use any particular method for specifying handlers. However, the examples, particularly those in the section on attaching the attributes directly to the handler, are intended to give examples of how they could be specified. It is however recognized that two methods are likely to occur often: scripting (such as XHTML's <script> element) and declarative markup using XML elements (such as WML's <onevent> element). A companion specification will provide markup to support these methods. The Basic XML Events Profile allows restrictions on the usage of the XML Events Module in order to make processing easier on small devices. The Basic Profile allows the following restrictions on the use of listener element and its attributes, and on the use of the attributes from the listener element as global attributes. The ability to process external event handlers is not required. When the 'handler' attribute on the listener element is used, or when the global 'handler' attribute is used, the handler specified in the value of that attribute should be within the current document. The binding of an event handler to an observer may be required to be lexically before the end of the observer element. In other words, a <listener> binding to an observer may not occur after the closing tag of the observer element, and an event handler carrying the attributes to bind it to an observer may also not occur after the closing tag of the observer element. This specification does not normatively specify how language designers should name events (i.e., the values used in the event attribute). However, future versions of DOM Events are likely to allow namespaced event names, so language designers are advised not to use the colon character ":" in event names. A number of event types are defined in DOM2 [DOM2EVENTS], to which you should refer for their names and semantics. The DTD implementation of XML Events conforms to the requirements defined in [XHTMLMOD]. Consequently, it provides a Qualified Names sub-module, and a module file for the XML Events module defined in this Proposed Recommendation. Note that this module defines the parameter entity %xml-events-attrs.qname;. This entity is intended to be used in the attribute lists of elements in any host language that permits the use of event attributes on elements in its own namespace. In this case the Host Language driver should set a parameter entity %XML-EVENTS.prefixed; to INCLUDE and a parameter entity %XML-EVENTS.prefix; to a value that is the prefix for the XML Events attributes. a definition of access to the DOM events model. Copyright 2000-2003 W3C (MIT, ERCIM, Keio), All Rights Reserved. PUBLIC "-//W3C//ENTITIES XML Events Qnames 1.0//EN"
for XML Events and extensions. XML Events extensions would create a module similar to this one. ('template-qname-1.mod') suitable for this purpose. namespace-qualified names for all XML Events element types. This is XML Events - the Events Module for XML. a redefinition of access to the DOM events model. PUBLIC "-//W3C//ENTITIES XML Events 1.0//EN"
The schema implementation of XML Events conforms to the requirements defined in [XHTMLSCHEMAMOD]. It is divided into an attributes module and an element module for the XML Events module defined in this Proposed Recommendation. This module defines the listener element for XML Events.
" Document Object Model (DOM) Level 2 Events Specification ", W3C Recommendation, T. Pixley, ed., 13 November 2000.
" XML Schema Part 2: Datatypes ", W3C Recommendation, P. V. Biron et al., eds., 2 May 2001.
" HTML 4.01 Specification ", W3C Recommendation, D. Raggett et al., eds., 24 December 1999.
" Synchronized Multimedia Integration Language (SMIL 2.0) ", W3C Recommendation, J. Ayars et al., eds., 7 August 2001.
" Scalable Vector Graphics (SVG) 1.0 Specification ", W3C Recommendation, J. Ferraiolo, ed., 4 September 2001.
" XHTML™ 1.0: The Extensible HyperText Markup Language (Second Edition) ". S. Pemberton et al., 26 January 2000, revised 1 August 2002.
" Modularization of XHTML™ ", W3C Recommendation, M. Altheim et al., eds., 10 April 2001.
" Modularization of XHTML™ in XML Schema ", W3C Working Draft, D. Austin et al., eds., 3 October 2003, work in progress. This document was originally edited by Ted Wugofski (Openwave). Special acknowledgments to: Mark Baker (Sun Microsystems), Wayne Carr (Intel Corporation), Warner ten Kate (Philips Electronics), Patrick Schmitz, and Peter Stark (Ericsson) for their significant contributions to the evolution of this specification. Daniel Austin, W. W. Grainger, Inc.